So I have some orders last week that I waited to post until Father's Day because one order was for Father's Day. So the cake up on deck was the Father's day cake that my adorable god-daughter asked me to make for her father (my god-father). The cake is Lemon flavored with Vanilla bean buttercream filling. The cake is decorated in white fondant with yellow and copper colored circles. Next up is some cupcakes that I made for Father's Day. 6 were Cinnamon Bun Cupcakes and the 6 were Chocolate cupcakes. Chocolate cupcakes with half chocolate buttercream and half vanilla buttercream. Next is a birthday cake I made for a friend of mine. Her sister contacted me because my friend loves my cakes so she wanted to surprise her by having me make her birthday cake. Pink & Black Fashion inspired Cake- White Chocolate cake with Vanilla Buttercream. Decorated with black fondant swirls, boots, handbags and high heel shoes. One of my repeat customers order another pineapple upside down cake for her husband for Father's Day since he loved the first one so much. I really appreciate it when customers come back and she is definitely a repeat customer because I will be making her daughter's birthday cake in July! The order I made was a special one... for my husband who has been a great dad! I wanted to show him how much I appreciate him so I made him some handy man cupcakes! Hand Man Cupcakes- Raspberry cupcake with Vanilla Buttercream topped with Blue fondant figures of hammer, screwdriver, drill, tape measure and the word handy man. Second Wedding Cake Order... plus new Equipment!!! So I delivered my second wedding cake today. I loved the way it came out! My client Hong wanted a cherry blossom wedding cake because they were having a pink and white wedding. Him and his fiance are Asian and wanted something to reflect the heritage. So I made them a 4 tier round wedding cake in white fondant with pink/white cherry blossoms. 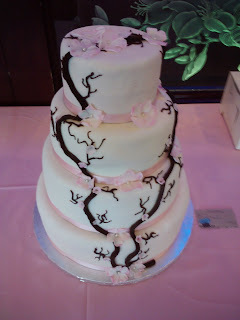 The branches are brown colored vanilla buttercream. I was also recently blessed with the money to bought some much needed equipment to expand my business so now I can do edible images and more complicated scroll work. I was able to get a Agbay cake leveler (which is a godsend because I get my cakes perfectly level now), Cricut Cake, Food Color printer ink and dedicated printer and a KitchenAid Artisan stand mixer! Now I would have given my left arm for the mixer itself, it makes baker so much quicker and easier. So you can imagine I was doing the happy dance all around the house when I was able to get everything else... it is Christmas in June for me! My beloved new mixer and its purple!! Last weekend I had my first wedding to cater and it came out beautifully (with the help of the hubby)! The couple I had the pleasure of catering a dessert table for Jessica & Steven wanted a yellow and green nature themed table along with wedding cake. The cake was 3 tiers carrot cake with cream cheese frosting. 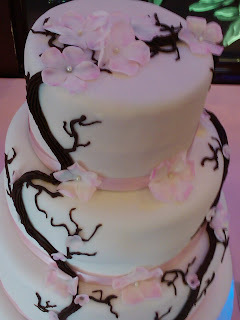 The cake was covered in green fondant with yellow cherry blossoms. They wanted simple yet elegant and I think I achieved that look. The dessert buffet was for 200 guests so I made a combination of brownies, cupcakes, cookie truffles and cake pops. The brownies were plain chocolate with a hint of vanilla and cinnamon which is my signature brownie. The cupcakes were cinnamon bun with cinnamon cream cheese filling and vanilla buttercream, lemon with lemon-lime buttercream, strawberry with lemon-lime buttercream, carrot with vanilla bean cream cheese buttercream, red velvet with vanilla bean cream cheese buttercream and chocolate chip with chocolate buttercream. The cookie truffles were chocolate oreo and golden oreo truffles. And the cake pops were strawberry, banana/chocolate, and white chocolate. Yummy!!! I will be blogging again on Saturday after the delivery of yet another wedding cake! Vanilla and raspberry cherry blossom... Until then peace and blessings!